Congratulations to Aviation Week's Pentagon Editor, Michael Fabey, on getting linked at Extra! Extra, the weblog of Investigative Reporters and Editors, Inc. The U.S. and Canada missed an opportunity to deploy an upgraded NORAD radar-based air defense system before the 2001 terrorist attacks because of problems that have hindered both countries' efforts to field a tried-and-proven system for more than a decade, including escalating costs, blown deadlines, mismatched technology and mismanaged programs, according to government audits and acquisition documents. Two years before the 9/11 attacks, the U.S. and Canadian NORAD partnership was supposed to start installing a new command-and-control (C2) system for the radars with capabilities that possibly could have been used to help stop terrorists from slamming their hijacked jetliners into the World Trade Center and Pentagon. The technology for that system would serve as the building blocks for the system the two countries eventually deployed last year - the Battle Control System-Fixed (BCS-F). What do you think? Should the US sell F-22s to allies like Australia, Japan, Israel, and South Korea? We're having a good discussion about this issue over on Feeling Degraded. Come join us. And remember, you can always sign up for a free subscription. A drastic rethinking of operational doctrine, along with new ways of using troops, weapons and information, will be necessary if the West is to be successful in fighting asymmetric adversaries. The battlefields on which Western armies wage war against ideologically driven, stateless enemies are fluid, multi-dimensional and without boundaries or borders. To dominate in this changing era of warfare, forces must embrace new tactical and strategic concepts and be mindful of the role opinion plays in determining which side wins and loses a conflict. These were the key points made by senior officers representing NATO and Israel at the recent Shephard Airpower 2007 conference in Berlin. Speakers and attendees, many veterans of the wars in Iraq and Afghanistan, and the battle against Hezbollah in Lebanon last summer, shared their perspectives on how the practice and the art of war are changing. Their observations and conclusions may form the basis for new tactics as nations face what one senior U.S. officer termed the decades-long struggle ahead with asymmetric enemies. We've got a whole issue full of great stories like this. Subscriptions are free. Why not sign up? It seemed to me that it would also be fitting to give Joris an official welcome to Aviation Week: Defense, even though he was here before me ;-) Furthermore, I want you, our readers, to know more about him. Short version: Joris has been in this business for over 20 years. He knows what he's talking about and is particularly expert on the European side of the Atlantic. 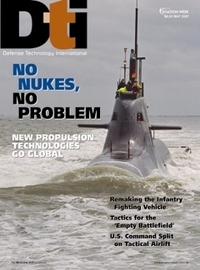 Those of us who are attached primarily to Defense Technology International take all three words in the title of that monthly seriously. Joris is our primary, full-time link to Europe, Asia, and Africa. Bill was born in England. David travels all over the world to get the story. And in addition to our full time staff, we have correspondents around the globe. One more thing about our full time editors: All three of them are extremely prolific. They will have no problem filling the pages of DTI and the posts of this weblog. As I did with Bill's post yesterday, I'm attaching the press release on Joris' hire to the bottom of this post in case you'd like to read it. As I mentioned earlier today, Bill Sweetman is our new Editor-in-Chief at Defense Technology International magazine. Bill has been in this industry for a long time. Amazon lists 60 items. Bill's resume lists 39 books. I'll append Aviation Week's official press release on Bill's position below, but the main thing is to say Welcome aboard, Bill. We're looking forward to working with you and the expertise you bring.